A woman was walking along the sea on a beach in Cornwall, England in 2012, when she by chance spotted a dark tablet in the sand, inscribed with a strange word. She shrugged off the curiosity. But a few weeks later she discovered another one on a different beach. Without knowing it at the time, she’d stumbled upon a phenomenon that many others had been experiencing across Europe for decades. They were all now involved in the mystery of the Tjipetir blocks. Not knowing how they rubber-like slabs might have come to be on various beaches, and confounded by the word punched into them – TJIPETIR – beachcomber Tracey Williams began some research into the origins of the dark, rubbery blocks. Williams found that Tjipetir (pronounced cheep-a-teer) is a village in West Java, Indonesia. Now named Cepetir, it was once the site of a Gutta-percha plantation during the late 19th and early 20th century. Gutta-percha “plates” were made from the gum of the Palaquium tree. The dark colored, rubbery latex substance was used widely in the manufacturing of items such as toys, golf balls, false teeth, surgical devices, jewelry, furniture, and was key in the development of underwater telegraph cables. In Malaysia, the indigenous people would use the wood and gum of the tree for making knife handles and walking sticks long before it was adapted by the Western world. For decades people had been finding the inscribed plates washed up on beaches across the United Kingdom, Germany, France, Spain, Netherlands and Sweden. 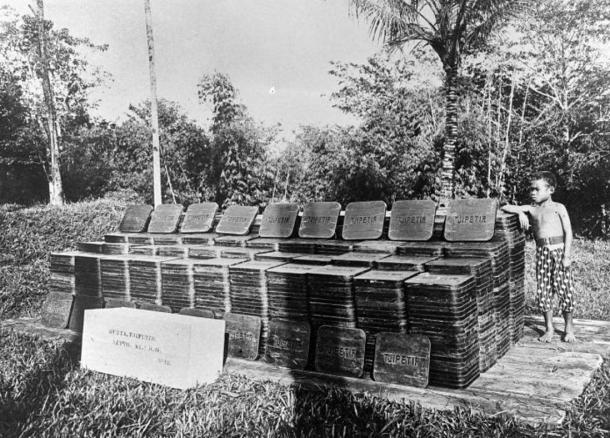 But the question remained: how had the plates made their way from Indonesia to the beaches of Europe? 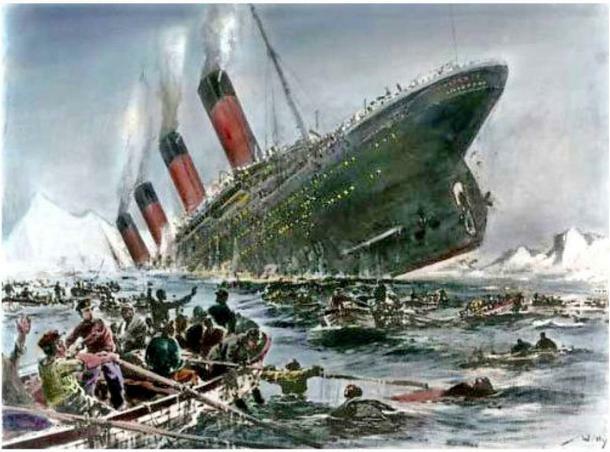 The answer is still not certain, but it is speculated that the blocks may have spilled into the ocean in 1912, as the infamously sunken ship, the Titanic, had Gutta-percha tablets and bales of rubber listed on the ocean liner’s cargo manifest. Alternatively, the tablets might have come from another stricken boat, a Japanese passenger ship named Miyazaki Maru. 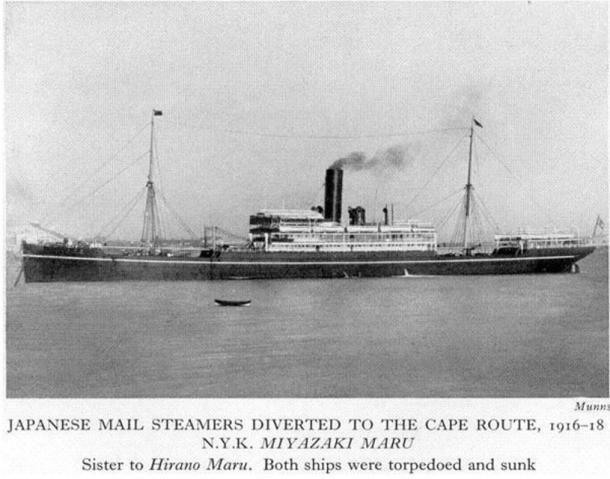 The Miyazaki Maru was said to have been carrying the rubber plates from Yokohama to London, but was sunk by a German submarine torpedo in May 1917. The plates might be still coming from any number of wrecks, floating to the surface as the sunken cargo ship breaks up below. As it takes some 25 years for floating debris to go around the world via currents, it may prove impossible to confirm the truth of the origins of the Tjipetir blocks, which will have been at sea for over a century. As they are a natural product, in time the blocks will degrade and eventually return to nature. Undoubtedly the slabs will continue to be retrieved from beaches by the curious, and will serve to unite people in history. Yet many Tjipetir blocks will remain undiscovered, traveling the seas and drifting ashore once in a while, only to return to the waters by the pull of tides. Great photos and stories relating to the Tjipetir blocks can be found at the Tjipetir Mystery Community Facebook page, created by Tracey Williams.